The arrow has recently become obsessed with photo albums. He can look at pictures of himself and family members over and over again. It can get repetitive, but it's definitely more interesting than reading Elmo Minds His Manners for the 300th time. Lately he's been looking at our 2009 photo book, which includes pictures from our trip to South Haven, Michigan. It was our first vacation as a family and we'll always remember it fondly. 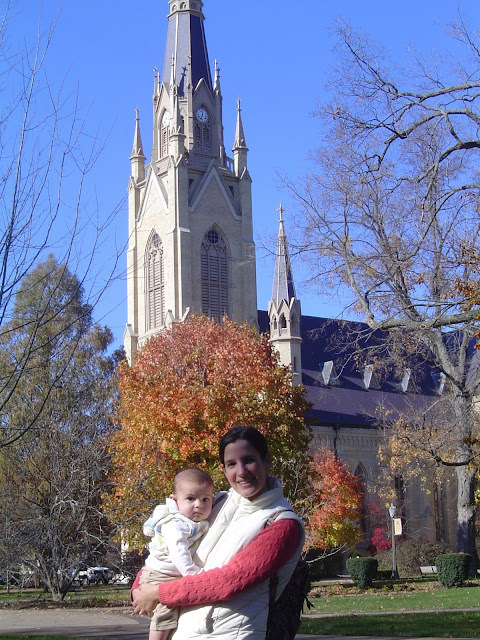 In order to survive our first long car ride with a baby, we planned a stop at the University of Notre Dame in South Bend. Notre Dame also happens to be my husband's alma mater. It was such a treat to watch him give the arrow his first tour of campus. Stopping in front of the Basilica of the Sacred Heart. Alum or not, Notre Dame is a beautiful place to visit. (You have to find your own cute baby to hold in your pictures, though, mine is taken.) Dominique at Midwest Guest has done some great posts about her trip there, which provide fascinating information on the architecture and artwork on campus. You can check out those posts here, here and here. I can't help but wonder what college visits we'll be taking 16 or 17 years from now. I know my husband will be hoping for a trip back to Notre Dame. I'm just glad we have many, many years until then. Thanks for the shout out! Notre Dame is a really beautiful campus. Since I started blogging, I've gotten really bad about keeping up with photo albums, but my boys do enjoy the ones I have made, especially our photo book from Paris. I think college campuses are often great places to visit with kids - lots of room to run around and often some nice small galleries or outdoor art to admire.